All Milpitas homes currently listed for sale in Milpitas as of 04/26/2019 are shown below. You can change the search criteria at any time by pressing the 'Change Search' button below. If you have any questions or you would like more information about any Milpitas homes for sale or other Milpitas real estate, please contact us and one of our knowledgeable Milpitas REALTORS® would be pleased to assist you. "Have you ever wanted to live on acreage in the Bay Area, yet found it prohibitive? 4140 Felter Road is the answer for you! 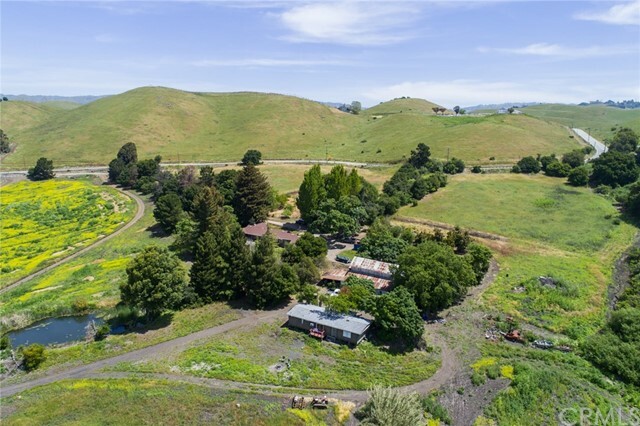 Set in the rural area outside of Milpitas, California, this 35 acre property boasts two homes, a barn, and a pond. This property is in the perfect location! 16 miles to San Jose and 52 miles to San Francisco make it close enough to the Bay Area, yet within minutes you are in the tranquility of the country. Take advantage of the options available to you on this property! Use the main home as a residence while you build your dream estate, upgrade the main home to suit your tastes, refurbish the second home and create a family compound or income opportunity, develop a vineyard, create paddocks and board horses, or enjoy the rustic nature of the property in its current condition. Bring your horses, your ATVs, your gardening tools, and your imagination and set roots in the land that you now own." "A rare opportunity to own a one of a kind home with spectacular view of the hills. Elegantly poised on a corner lot with incredible curb appeal. This amazing two story custom home has over 90% new construction and boasts approx. 4,510 sqft living space. This luxurious home offers a very spacious master bedroom with an elegant bathroom that features dual vanities, shower, tub and a large walk-in closet. Additionally, there are four other en-suite bedrooms with stunning bathrooms in each. The home has a total of six bedrooms and five and a half bathrooms. The gorgeous gourmet kitchen is bright and spacious with a large center island and a wine closet. The grand dining area and the entertainment/living room with a full bar is perfect for entertaining guests. This home is ready for the new owners to add their own personal touch by selecting their desired finishings. The garage is EV ready with dual charging outlet. Close to many shops, restaurants, grocery and easy freeway. Must see!" "Beautiful home with the incredible large size lot. Possible to build another 1600 sq ft home in the backside. Lot of space to park small Boat and small RV. Beautiful green Backyard, There is a beautiful rug lying down in the separate living room. Formal Dinning room and separate Family room. Come and see it." "**Curtner Elementary**Two Story Shapel Beauty with Modern Amenities*One Large Bedroom & Bathroom on Ground Floor*Cathedral Ceilings*Large Dinning Area*Separate Family Room with Dual View Fireplace*Refreshed Open Concept Kitchen with Designer Cabinets,Quartzs Counter Tops & Mosaic Tile Backsplash, Large Center Island with Breakfast Bar & New Tile Flooring**New Exquisite Light Fixtures*Newer Laminate Flooring on Ground Floor*Newer Plush Carpet & Pad in Upstairs Bedrooms*Central Heating & Cooling*Multi Zone Heating Feature*Updated Baths with Double & Single Sink Vanities*Upstairs Features Large Loft Area- Great spot for Study or Office*Huge Master Bedroom Suite Features large Walk in Closet*Dual Pane Windows*Copper Plumbing*Large Backyard with New Concrete and Newly Constructed Awning*Low Maintenance Front & Back*2 Car Garage with Built in Storage*Convenient Location Close to Schools, Parks, Shopping & Freeway*Must See!" "Newly remodeled almost 2000 sqft 4 Beds & 3 Baths beautiful within 7 minutes of the new Milpitas BART station. New stucco; Freshly new interior and exterior paint; New kitchen cabinets and floor with granite counter-top with all new appliances (refrigerator, gas/oven, dishwasher, exhaust, and more!). Brand new central ac & heat. Newly Remodeled bathrooms; New tile, laminate wood floor through out the entire house; new interior doors and double pane window through-out the house as well. Only 10 minutes to Great Mall and 10 minutes to 237; Awesome location! Excellent schools! Great condition corner home will not last long! The location of this amazing home and unbeatable! Enjoy with your family in the remodeled large open family room extended with permits! 2 car garage! Newer roof! Walking distance to Murphy Park and Rancho Middle School!" "Built only 6 years ago, this beautiful single family home is located in the enchanting Sundrop Circle community and offers 2,037 sq.ft. of light-filled contemporary living space. This 4 bed/3.5 bath home has functional and open floorplan and is ideally arranged with a ground-floor bedroom + full bath and the remaining 3 bedrooms including the master suite on the top floor. In between is a completely open great room with elegant hardwood floors and multiple sitting areas, a huge dining area and a fabulous chef's kitchen with a huge leathered-granite countertop and center island, high-end stainless steel appliances and premium finishes. Adding to the appeal is an inviting deck and gated garden patio for outdoor enjoyment. Attached 2-car garage, inside laundry, dual-paned windows, central A/C. Moments away from Milpitas Town Center and major commute routes and BART (South Bay Bart extension which will carry BART into the heart of downtown San Jose is scheduled to open Fall 2019) ." "New and beautiful home that includes Granite Slab and full backsplash in the kitchen, Shaker style maple flat panel cabinetry with satin nickel pulls, concealed hinges and stainless steel appliances, Piedrafina cultured marble shower surround, NEST thermostat, Upgraded hardwood floor in the living room, kitchen and dinning area. 2 car garages and 1 assigned parking space, large enclosed porch and deck. Energy Save with Solar Power, Tankless water heater." "Recently remodeled home with new kitchen in the Milpitas Pines neighborhood. Brand new cabinets, countertops and decorative tile back splash. Tile floors in kitchen with stainless steel appliances. Dual pane windows with window casings. New extra tall baseboards. New wood floors and fresh paint through out. Conveniently located to the Great Mall, BART station, and shopping plazas. Perfect location for tech companies nearby and commuting access to 680 and 880." "Shapell Townhouse in exclusive Hillcrest community in Milpitas foothills. Biggest model with a family room. Corner unit looks like a single family. Spacious living room with a fireplace, Bright with natural light. Huge elegant master bedroom suite, retreat and bay window, 2 closets, one walk-in. Large round tub in master bath with his and her vanities. Formal dining with Bay windows. Stairway leading to Built in library. Central AC. Hardwood floor. Marble tiles in kitchen and family room. Refrigerator and other appliances, Granite kitchen counter top. Chandelier in dining area, Recessed lights in family and living room. Finished backyard. Green belt, swimming pool, hot tub and Childrens park and walking trails. Top Schools: Sinnott Elementary, Rancho Middle and Milpitas High. Easy access to highways, close to BART." "Welcome to this beautiful hidden gem in Milpitas. Bright and spacious home built by Standard Pacific. High ceilings with open flowing floor plan, kitchen overlooking family room with modern open lay out. Spacious master suite with vaulted ceilings, ceiling fan, comfortably large bathroom and walk-in closet. Tile & wood floors installed in 2017. Perfect home for indoor/outdoor living and entertaining. Low maintenance backyard. Walk to Starbucks, shopping, dining, parks. Conveniently located near Hwy 680 & Hwy 237, upcoming Milpitas BART station. Close to Milpitas Town Center and under 15 miles from major employers such as Google, Samsung, Microsoft, Intel, and much more. Desirable Milpitas schools including Milpitas High School." "PHENOMENAL & RARE TO FIND CORNER LOT 4 BEDROOMS/3.5 BATHS TOWNHOUSE( PUD) LOCATED IN THE HIGHLY SOUGHT-AFTER HARMONY COMPLEX. DESIRABLE, MODEL-QUALIFY TOWNHOUSE W/ THE LARGEST FLOORPLANS FEATURING DRAMATIC HIGH CEILING, SUPERIOR TASTEFULLY UPGRADES, MODERN LAYOUT W/ LARGE CHEFS KITCHEN, INCLUDING UPGRADED GRANITE COUNTER TOP, GAS RANGE, SUPER-SIZED KITCHEN'S ISLAND, STAINLESS STEEL APPLIANCES & BREAKFAST NOOK. HIGH-END HARDWOOD FLOOR THROUGHOUT. RECESSED LIGHTS. TONS OF CABINET & CLOSET SPACE. ALL BEDROOMS ARE VERY SPACIOUS W/ A BEDROOM SUITE ON THE 1ST LEVEL. THE MASTER RETREAT BOASTS A HUGE WALK-IN CLOSET, LARGE BATHROOM W/ DUAL VANITY, BATHTUB & TILE FLOORS. DOUBLE-PANE WINDOWS, PATIO, SIDE BY SIDE GARAGE. LOW HOA BUT FULL OF AMENITIES, INCLUDING GREENBELT, BBQ AND KIDS PLAYGROUND AREAS. EASY ACCESS TO NEW BART, FREEWAY 680/880/237, PUBLIC TRANSPORTATION & ALL MAJOR HIGH TECHS. WALKING DISTANCE TO NEW ASSIGNED ELEMENTARY SCHOOL MABEL MATTOS, PARK, SHOPS & MORE." "Beautiful Quiet & desirable location in the heart of Milpitas. Large Lot with big size house 2000sqf with 4bedroom and 2.5 bath. Property features bright floor plan, large living room and big family room . Updated kitchen with quartz counter tops. Huge backyard with deck." "NOW SELLING!!! Introducing this special edition of 25 townhouse-style condos at Milpa Village in Milpitas. Offering one of the best home values in the area, the community is in close proximity to central Milpitas and the Great Mall shopping complex. You will also enjoy all the conveniences of nearby schools, parks, shopping center, including the new Milpitas BART station. Milpa Village will feature four 3-story buildings and offer three well designed, distinct 3-bedroom floor plans with up to 2,026 square feet of living area. Each floor plan has an expansive family room and dining area adjacent to the gourmet kitchen. The kitchen comes with granite slab counter top, attractively designed full backsplash, stainless steel appliances including a refrigerator plus a convenient center island. The units consist of three bedrooms, interior laundry room plus a downstairs bonus room with a two-car attached garage. The site location is 260 S. Main St., Milpitas, 95035." "Best of Milpitas and in an Excellent neighborhood! Home is in a corner lot, Upgraded kitchen cabinets, granite counter tops, new sink, faucet, built-in decor wall shelving. Added loft buyers to verify sqft. Conveniently located near freeways, Dixon Landing Community Park and Sports facility. Well-maintained in and out." "BRAND NEW HOME!Gorgeous Brand New townhouse-style home in the pristine Prynt by Taylor Morrison. Located in the Crossroads of Silicon Valley, Prynt makes it easy to enjoy all of the amenities the city of Milpitas and the greater South Bay have to offer. Less than 1 mile from The Great Mall of the Bay Area. Homesite #17 is a unique Residence 3 live/work end unit, in the back building away from the main road, with 2 bedrooms, plus a stunning floor to ceiling glass live/work space on the ground floor (ideal for a home office or den). 2 full baths, and 2 baths, totaling approximately 1,774 square feet, with a 2 car attached side-by-side garage. This home has 2 bedrooms on the third level, in addition to the live/work space on the ground floor. Exclusively located within a private community in the Milpitas, there is everything to love about this gorgeous town-home! '' if you are having trouble finding the address Please use (75 S Milpitas Blvd. Milpitas CA 95035)." "BRAND NEW HOME!Gorgeous Brand New townhouse-style home in the pristine Prynt by Taylor Morrison. Located in the Crossroads of Silicon Valley, Prynt makes it easy to enjoy all of the amenities the city of Milpitas and the greater South Bay have to offer. Less than 1 mile from The Great Mall of the Bay Area. This fabulous open floor plan offers 1708 square feet of spacious living, 3 Bed, 3.5 Bath, 2 car garage, with a 2 car attached side-by-side garage. This home has 1 bedroom on the main floor, and 2 bedrooms on the third level. Including upgraded cabinetry, quartz counter-tops, located just steps away from retail, entertainment, and recreation activities. Exclusively located within a private community in the Milpitas, there is everything to love about this gorgeous town-home! '' if you are having trouble finding the address Please use (75 S Milpitas Blvd. Milpitas CA 95035)"
"BRAND NEW HOME!Gorgeous Brand New townhouse-style home in the pristine Prynt by Taylor Morrison. Located in the Crossroads of Silicon Valley, Prynt makes it easy to enjoy all of the amenities the city of Milpitas and the greater South Bay have to offer. Less than 1 mile from The Great Mall of the Bay Area. This fabulous open floor plan offers 1708 square feet of spacious living, 3 Bed, 3.5 Bath, 2 car garage, with a 2 car attached side-by-side garage. This home has 1 bedroom on the main floor, and 2 bedrooms on the third level. Including upgraded cabinetry, quartz counter-tops, located just steps away from retail, entertainment, and recreation activities. Exclusively located within a private community in the Milpitas, there is everything to love about this gorgeous town-home! '' if you are having trouble finding the address Please use (75 S Milpitas Blvd. Milpitas CA 95035)." "Gorgeous Brand New townhouse-style home in the pristine Prynt by Taylor Morrison. Located in the Crossroads of Silicon Valley, Prynt makes it easy to enjoy all of the amenities the city of Milpitas and the greater South Bay have to offer. Less than 1 mile from The Great Mall of the Bay Area. Homesite #25 is a unique Residence 3 live/work end unit, in the back building away from the main road, with 2 bedrooms, plus a stunning floor to ceiling glass live/work space on the ground floor (ideal for a home office or den). 2 full baths, and 2 baths, totaling approximately 1,774 square feet, with a 2 car attached side-by-side garage. This home has 2 bedrooms on the third level, in addition to the live/work space on the ground floor. Exclusively located within a private community in the Milpitas, there is everything to love about this gorgeous town-home! '' if you are having trouble finding the address Please use (75 S Milpitas Blvd. Milpitas CA 95035)." "Stop Paying your landlord Twenty plus Thousand dollars a year. Walk to the New Milpitas Bart Station. Come by today and see this gorgeous 3BR plus bonus 2.5 Bath corner home with a huge 2 car garage. This Brand new Construction EAST facing home with a 10 year warranty has all of the upgrades you would expect. Upgraded cabinets, Upgraded Ceaserstone countertops, Upgraded Stainless Steel appliance package, UPGRADED Walk in Shower with Glass entry, Upgraded Floors, and this corner home has Tons of light. It also has a, PreWire for Electric Car Charger, Pre wire for Solar, ON demand tankless water heater. Don't miss this amazing home,,,,, listing agent is extremely easy to work with. EASY ACCESS TO FREEWAY, PUBLIC TRANSITS & ALL MAJOR HIGH TECHS. WALKING DISTANCE TO NEW ELEMENTARY MABEL MATTOS, NEW PARK, GREAT MALL, NEW SHOPPING CENTERS & The Brand NEW Milpitas Bart Station Opening this year."